Is there a bear here? 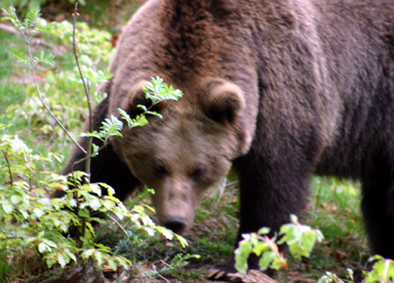 The following advice is based on the collective opinion of leading experts such as Stephen Herrero, author of the highly-acclaimed book "Bear attacks: their causes and avoidance", and his colleagues from the Safety in Bear Country Society. We cannot guarantee that these recommendations will protect you from being injured by a bear, but they can help you reduce the risk. If you want to learn more, we recommend the excellent film "Staying safe in bear country". Each bear and set of circumstances are different, so it is difficult to determine exact rules which apply in every situation. 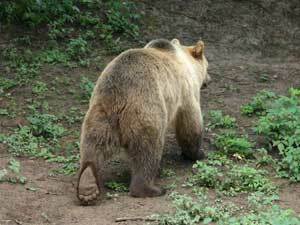 However, people working with bears say that their behaviour is much more predictable than most of us think. Prepare for possible scenarios in advance. If you live or work in an area with bears, or you visit such an area, you should know how to anticipate the most common situations when you can encounter a bear. It is good to rehearse how you would react. This knowledge and preparation can help you to behave appropriately and avoid an attack if you encounter a bear. If you do not want to have problems with bears it is best to avoid them. By using simple preventive measures you can reduce the chance of encountering a bear. It is equally important not to attract one. In forest, and localities near forest, be alert, especially in the morning, evening and at night, when bears are more active, but also during the day in dense vegetation or near food sources. Look out for tracks or other signs of bear presence - if they are fresh, increase your alertness. 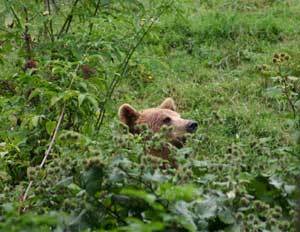 If visibility is restricted it can help to talk, whistle or otherwise give bears advance warning of your presence. Bears will usually avoid you if they know you are there. An exception is a bear habituated to people, for example a so-called "container bear" (one that feeds on refuse). Even taking these precautions you could still meet a bear. It is possible to surprise a bear if the wind is not blowing from you towards it, if it is hidden in dense vegetation or is concentrating on food. 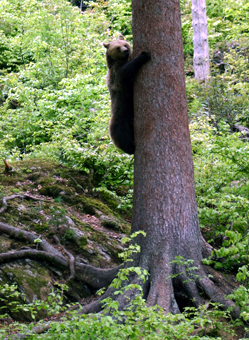 The closer you are to a bear at the moment when it notices you the greater the chance that it will react defensively. 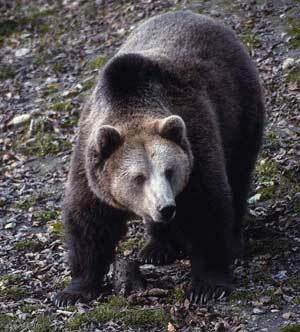 A defensive bear considers you a threat to itself or its young, or it could defend its food. Usually it will look agitated and restless. A completely different case is if a bear gets used to feeding on refuse and loses its fear of people. 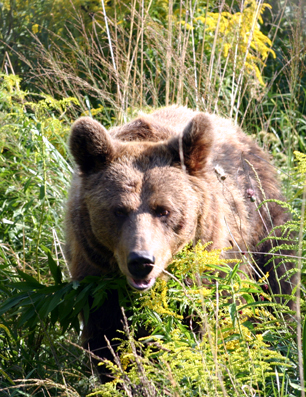 Bears used to human food can be bold and approach deliberately in order to get it. They can come right into your campsite, rip your tent or enter a building. There are also other reasons why a bear might not avoid you, or might even approach you, for example it might approach in order to test its dominance. It is very important to understand the difference between defensive behaviour and other types of behaviour, because your reaction should be different. Stand still and assess the situation - does the bear know you are there? If it does not know you are there, go back the way you came and make a large detour around the bear. Do this quietly, when the bear is not looking towards you, and keep watching it. Leave it plenty of room and an escape route. If it is moving towards you, watch for any change in its behaviour. Make a wide detour around it or go back the way you came. Be especially careful not to get too close or surprise the bear. If you shout at a bear that was unaware of you, you might provoke an attack. Never approach a bear, even if it seems to be calm. If it is obvious that you cannot leave without the bear noticing you, stand your ground and quickly assess the situation. Do not run - it could provoke pursuit. If it stands on its hind legs it is trying to identify you by sight and smell. Calmly (so as not to startle it) and from as far away as possible identify yourself as human - talk to it in a low, firm voice and slowly wave your arms over your head. Increase the distance between you and the bear by backing away slowly. If the bear is aware of you and it does not seem to be interested, you should use the chance to leave. Stand your ground. Try to keep calm, attacks are rare. If possible, keep together in a group. Do not run unless you are certain that you can get to safety - a bear can run faster than a person, uphill and down. Climbing a tree can sometimes be a solution, but it is not a guaranteed place of safety and you need to get at least 4 metres off the ground. Defensive behaviour is almost always a result of you entering a bear's personal space, surprising it or getting too close to it. Occasionally a bear that is unaware of you can approach and be startled. A defensive bear is agitated. You have entered its personal space and it considers you a threat. It might move away or it might stay nearby, agitated and uncertain. It might approach or attack you. Try to stay as calm as possible - encountering a defensive bear can be a terrifying experience but physical contact is rare. Do not shout or throw anything at the bear - this can provoke an attack. Try to look non-threatening. During a sudden close encounter avoid looking into a predator's eyes (for the animal this is a sign of aggression). Talk to the bear in a calm voice - this can help calm you and the bear. If the bear is not moving towards you, carefully try to move away but keep watching the bear. Remember, you have entered the bear's personal space. Moving away is the best solution in such situations. If you move away, usually the bear will calm down. If the bear keeps approaching, stand your ground. If the bear stops, try to increase your distance again. Whenever the bear approaches you or if it charges, stand your ground. An attack means the bear makes physical contact. 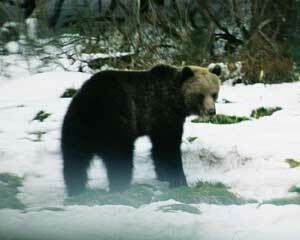 If the bear charges, it is often only a bluff - it stops or changes direction before direct contact. If you are physically attacked and it is a defensive attack, lie down on the ground and play dead. Lie on your belly, legs slightly apart. Join your fingers behind your head. This position will protect your face and neck. In defensive attacks bears often concentrate on a person's face if it is not protected. If you have a rucksack on your back it can provide some protection to your back and neck. If the bear turns you over, roll back over so that you have your belly and vital organs protected by the ground. When the bear senses that you are not a threat it will usually leave. When the attack stops, keep laying still and wait until the bear has definitely left. 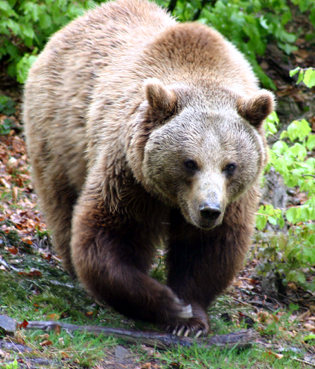 A bear that is deliberately approaching you, showing little or no sign of stress, is not doing it in self-defence. It could have other reasons. It might be curious, habituated to people or human food or it could be asserting its dominance. The way in which these bears approach may all seem similar but your best reaction is the same in each case. Stand your ground. Keep as calm as you can and talk to the bear with a calm voice. Try to get off its path or out of its way. This might be all that it wants. If it continues towards you and its attention is focussed on you - stand your ground. Stay standing still. If the bear stops, back away again but keep watching its behaviour. Fight back aggressively against any bear that attacks you in a building or tent.